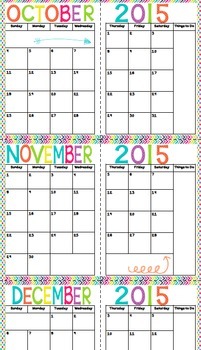 This whimsical calendar is full of bright and fun colors. 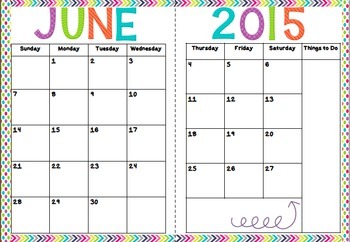 It starts with June 2015 and ends on July 2016. The week starts out as Sunday and ends on Saturday. 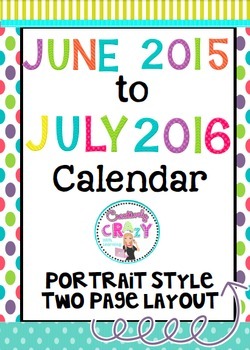 I have made this calendar portrait style and it is a two-page layout. Check out the preview to view this product in more detail. It is suggested to print out all pages, punch holes on the sides where there is not a border and input it into a 3-ring binder. Check out my Hello Organization Packet Coming This Summer! Check out my Facebook Flash Freebies all week long during Teacher Appreciation Week. You can also follow me over at my blog and Bloglovin! Pictures of these products in action! Need more? Read about how these products help transform education.